The Maya Counter Stool provides a simple sturdy round frame accented by the natural sea grass swivel seat. 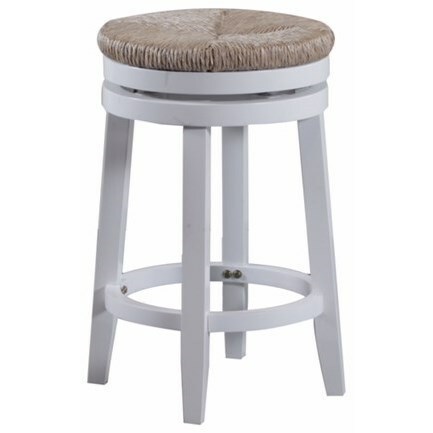 This casual Counter Stool with its beautiful white finish will compliment any décor. The Bar Stools & Tables Maya Counter Stool by Powell at HomeWorld Furniture in the Hawaii, Oahu, Hilo, Kona, Maui area. Product availability may vary. Contact us for the most current availability on this product. Choose from a variety of bar stools & tables in this bar stools and game room collection to suit your home style. Back types include oval backs, stamped backs, and scroll backs, as well as more contemporary designs. An assortment of seat types are available as well, ranging from wood seats to black faux leather seats to bright acrylic seats. Make your bar or casual dining area shine with one of these unique and refreshingly designed bar stools and tables. The Bar Stools & Tables collection is a great option if you are looking for Casual furniture in the Hawaii, Oahu, Hilo, Kona, Maui area. Browse other items in the Bar Stools & Tables collection from HomeWorld Furniture in the Hawaii, Oahu, Hilo, Kona, Maui area.